The Charcutepalooza challenge this month is brining. The suggestion was corned beef, but as I've already done that, I took it one extra step and made pastrami. 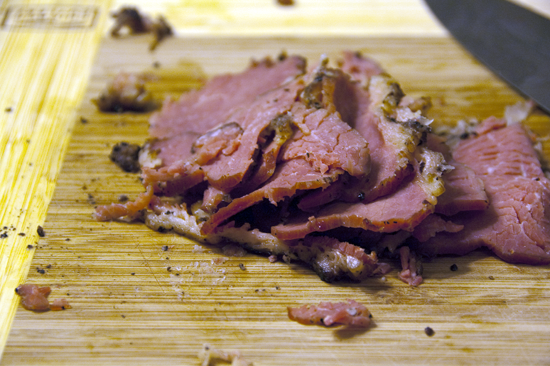 As Ruhlman points out, pastrami is just corned beef beneath a smokey crust. And to tell the truth, I wasn't much impressed with the corned beef. It looked fine, but the taste was just okay. (To be fair, I'm not a big fan of commercial corned beef either). It also just crumbled when I sliced it. Not a problem if you're making corned beef hash, but not so convenient when you're trying to slice it to serve in sandwiches or for dinner. I much prefer the pastrami. The peppery crust and smoke just adds that extra som-in' som-in'. Let me just say, if you can brine a turkey (or chicken or pork chops), you can make your own corned beef. It takes less than a week (still plenty of time till St. Patrick's Day! ), and the only special ingredient you'll need is pink salt* (Prague powder #1). 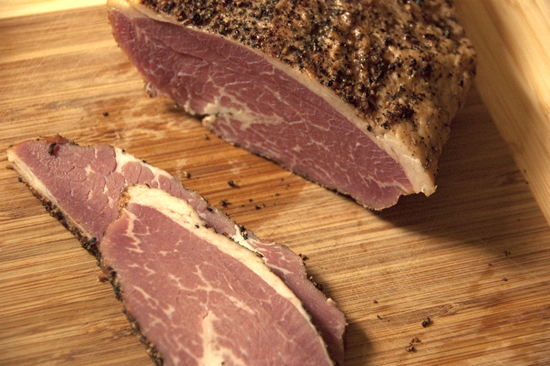 If you have a smoker, you're one step closer to pastrami. The suggested cuts for this technique are beef brisket or beef plate, but I used a tri-tip roast. ** That's what I had on hand⎯ no point in ordering a whole other cut. 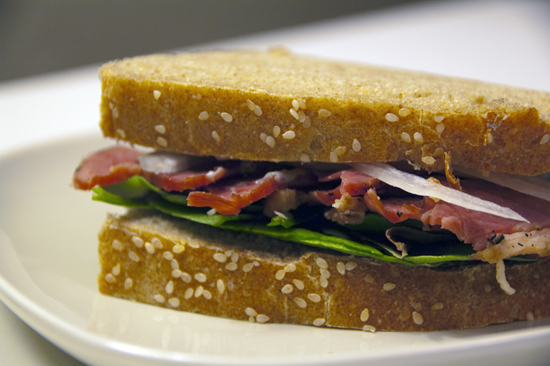 You could even use top round, which is what is used to make the pastrami from the deli at your grocery store. You'll just have to play around with the brining times for this thicker cut of beef. Of course, you can corn and smoke other types of meat too. I've seen turkey pastrami at my local grocery. Never tried it, but I imagine brining and smoking can only improve the flavor of turkey breast. I worked at a restaurant in Copenhagen that served corned duck breast (which is literally translated as exploded duck ☺) with a slightly sweet horseradish cream sauce atop rye bread. Wouldn't say I was a fan of this preparation for duck breast, but it was fairly popular. Maybe I'll revisit the exploded duck, now that my tastes have changed. Heck, I might even smoke it. We'll see. I originally made a little over 2 pounds of pastrami, but most of it disappeared in short order. Mostly we've been using it for simple sandwiches. I did cut a few thick slices and fried them up to eat with creamy scrambled eggs for Sunday brunch. I've been craving hash and planned to do that, but well, there's no more pastrami. Guess I'll have to make some more. In other charcuterie news, my duck prosciutto was a disappointment. The texture was fine, but it tasted too gamey for me. (I've experienced this with traditional prosciutto as well.) Interestingly, Hubby and the rugrat liked it. More for them, I guess. *Just order it. Then you'll be able to make cool things like bacon and Canadian bacon. **The tri-tip was purchased from Thundering Hooves, located in Walla Walla Washington. Unfortunately, they just very recently stopped delivery to their Portland buying clubs. I hate it when something I like goes away. Ugh.